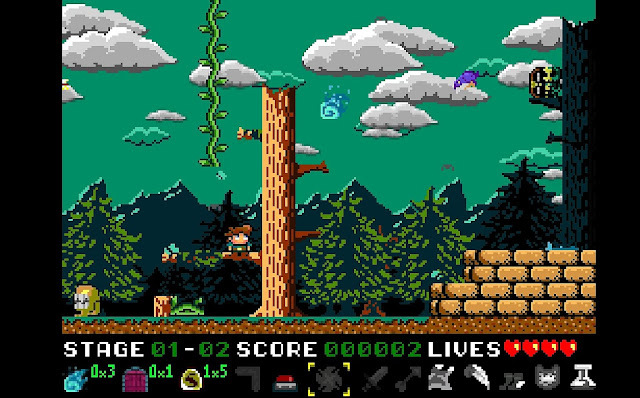 As most of you know by now LUEGOLU3GO STUDIO's have been working on a game called Nogalious, that had a successful Kickstarter campaign raising €25,862 to be released on multiple systems such as the Amstrad, C64, ZX Spectrum, MSX and even the PC. Well if you've been wanting to play this game since its announcement, you'll be pleased to know the developers have released a short PC demo that all can enjoy! Nogalious : The Chronicles is a 2D adventure platformer with multiple universes created pixel by pixel as a vintage adventure inspired by the golden era of 8-bit video games. 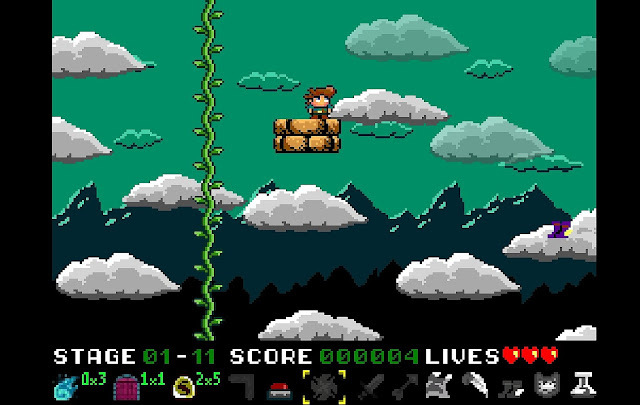 Along the way and more especially in this demo you'll be climbing vines, picking up usable items and weapons all the while trying to avoid the rather nasty beasties such as the green creature that follows you around for certain death. Be aware the demo isn't easy and 9 times out of 10 you'll either fall on the spikes, sliced by an enemy or end up shot at by flying arrows. Whoever said retro games were easy?